Discarded fishing nets will be recycled into volleyball nets for local communities, the World Volleyball Federation (FIVB) has confirmed. Good Net is a joint project by the governing body and marine conservation group Ghost Fishing Foundation. About 640,000 tonnes of fishing equipment is found in the ocean every year, causing danger to marine life. "There are so many nets that are doing so much harm out of sight," Brazilian three-time Olympic medallist Giba said. "It was really hard to learn that. As volleyball players, nets are at the centre of our game and of our joy." 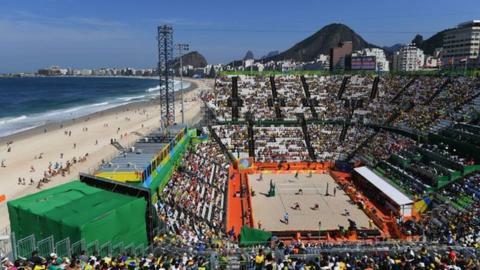 The project was launched last weekend at Copacabana Beach, the location of the 2016 Rio Olympic Games' beach volleyball tournament. Ghost nets are lost, abandoned or discarded fishing nets, with an average of 70 large whales becoming entangled in them every year along the west coast of the United States. "As divers, we care deeply about the oceans," Ghost Fishing CEO Pascal van Erp said. "We understand just how ghost nets do a huge amount of harm to marine wildlife in places where only a tiny few can see that damage is being done." Good Net says they hope to spread the campaign internationally as part of the FIVB's global schedule of beach volleyball and volleyball competitions. Netherlands-based Ghost Fishing Foundation works alongside the United Nations' Clean Seas campaign, by sending teams of divers to help combat the issue of marine plastic pollution. A fast, energetic sport played either outdoors or indoors where quick reactions are required.